Since the explosion of Real Techniques onto the Budget Beauty Scene, brands and manufacturers have realised that beauty fanatics now know it is possible to bring us the makeup tools we want and need without causing us to wince in pain at the cost. £26 for an eye brush? Only as a treat, and if you feel like you absolutely need it. More and more brands other than Real Techniques are bringing us brushes we want to add to our collection and at great value. We can now buy two or three brushes for the same price as one MAC brush, and it doesn't have to be Real Techniques. 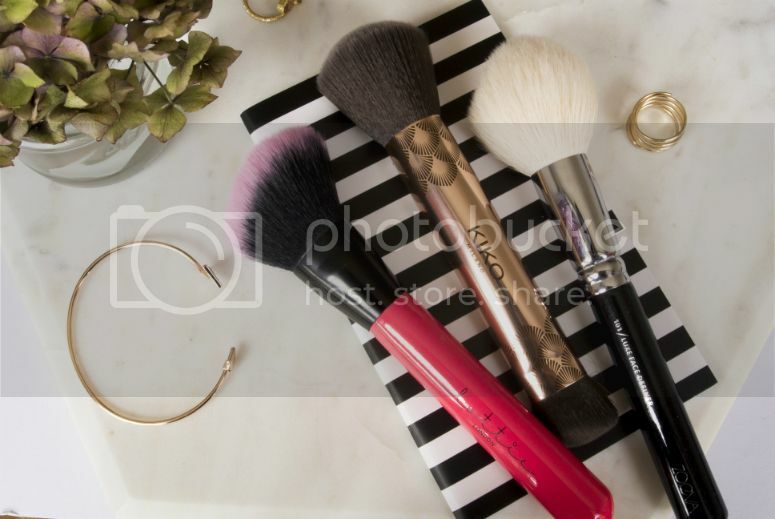 In this post I round up the three brands that I think are really worth looking into for brushes if you haven't already. Zoeva: Needs no introduction at all really. These brushes are seen all over the place, especially their highly coveted Rose Gold collections. I have yet to dip my toes into their sets, mostly because I bought a few of their brushes already that feature in them, and have yet to justify having my brush collection spill over 3 pots just to accommodate them. (I'm pretty sure I would get asked serious questions from the other half!) I rely on the 225 Eye Blender for all eyeshadow application, and use the 102 Silk Finish as one of my buffing brushes, rotating in whenever brushes need cleaning. I also have the 101 Luxe Face Definer, shown above, which I adore, but sometimes can't bring myself to use for fear of ruining its lovely white hairs. Daft I know, I'll get over it at some point, because it's very good with bronzers. These brushes get a whole lotta love for their great quality and presentation, and excellent value for money. KIKO: Everyone knows KIKO for their cosmetics, but I've not read much about their brushes. Picking this up on a whim while browsing the new collections, the Rebel Romantic Face Brush has been a surprise love for me. Fantastically soft and in stunning presentation, this brush is an absolute beauty. It's double ended, and is designed to be a companion to the Perfecting Bronzer, with the larger brush specially designed with a slightly lighter circular spot in the centre to match the bronzer. There is a smaller brush on the other end which goes really well with contour, blush and highlighting products. The only problem with it being double ended is that I don't want to store it standing up, in case I squash the hairs! This really has encouraged me to go back and try out some of their other brushes. Lottie London: Wow. Just wow. An accidental find which I stumbled on while browsing one of the only interesting stores in a visit home, Lottie London are a great budget brand that is more aimed at a younger market, but hey, the bargain hunter in me couldn't resist. To judge a brush range, I always pick up a face brush because they cover so much more of the face. In this case, I chose the Tan Time Bronzer Brush. Dense, fluffy, and ridiculously soft, this brush is that good, I have been making a list of all the brushes I want to pick up from them. Also, the most expensive brush they offer is their Kabuki Babe Brush at £9.50. £9.50!! That is insane! Another thing I love about this brush range is the fact that all the brushes have cute bright colours that make them really easy to distinguish. Trust me, when you're as bad as me in the morning, bright colour coding is a huge help. I've just discovered ASOS stock Lottie London as well, so time for me to fill my boots with this brand from the comfort of home. Win win. The growing market for budget brushes and tools is expanding, so I hope that this post has directed you to a few more, I'm always happy to help people save some money on tools, they can be so dear. There are loads of brands out there that I have yet to try, but I'm always willing to try more, so send me your recommendations if you have any! I'd love to try out Kiko products. We've got our first Kiko store somewhere in Rotterdam (The Netherlands). I really need to go check it out. Twenty-something Londoner giving ten-a-penny thoughts on beauty, fitness and anything that comes to mind!